AWS OpsWorks Stacks is a configuration management service that helps you configure and operate applications of all shapes and sizes using Chef. You can define the application’s architecture and the specification of each component, including package installation, software configuration, and more. 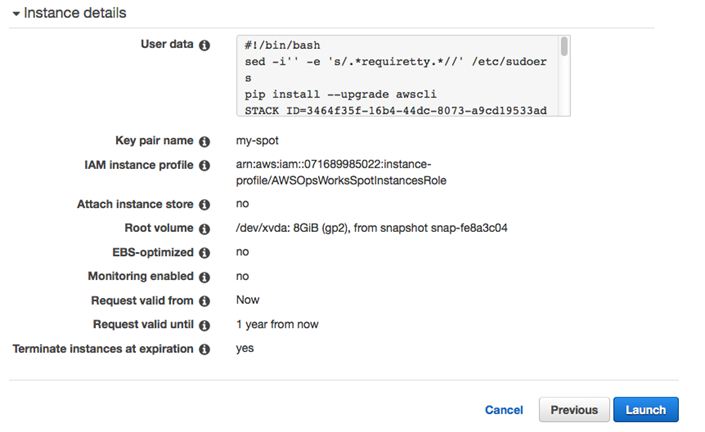 Amazon EC2 Spot instances allow you to bid on spare Amazon EC2 computing capacity. Because Spot instances are often available at a discount compared to On-Demand instances, you can significantly reduce the cost of running your applications, grow your applications’ compute capacity and throughput for the same budget, and enable new types of cloud computing applications. As a part of an Auto Scaling group, as described in this blog post. You can follow the steps in the blog post and in the launch configuration described in step 5, choose the Spot instance option. To provision a Spot instance in the EC2 console and have it automatically register with an OpsWorks stack, as described here. The walkthrough assumes that your stack and the following resources you create are located in N. Virginia (us-east-1). If you want to use another region, be sure to set the region parameter accordingly. IAM instance profile: an IAM profile that grants your instances permission to register themselves with OpsWorks. Lambda function: a function that deregisters your instances from an OpsWorks stack. Spot instance: the Spot instance that will run your application. 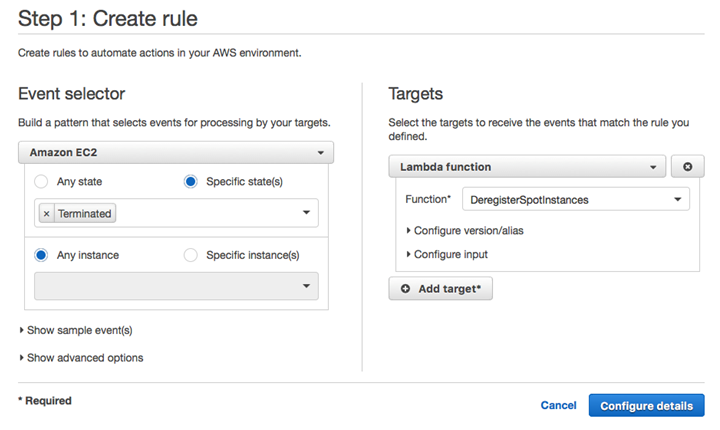 CloudWatch Event role: an event that will trigger the Lambda function whenever your Spot instance is terminated. When a Spot instance starts, it must be able to make an API call to register itself with an OpsWorks stack. By assigning an instance with an IAM instance profile, the instance will be able to make calls to OpsWorks. Open the IAM console at https://console.aws.amazon.com/iam/, choose Roles, and then choose Create New Role. Type a name for the role, and then choose Next Step. 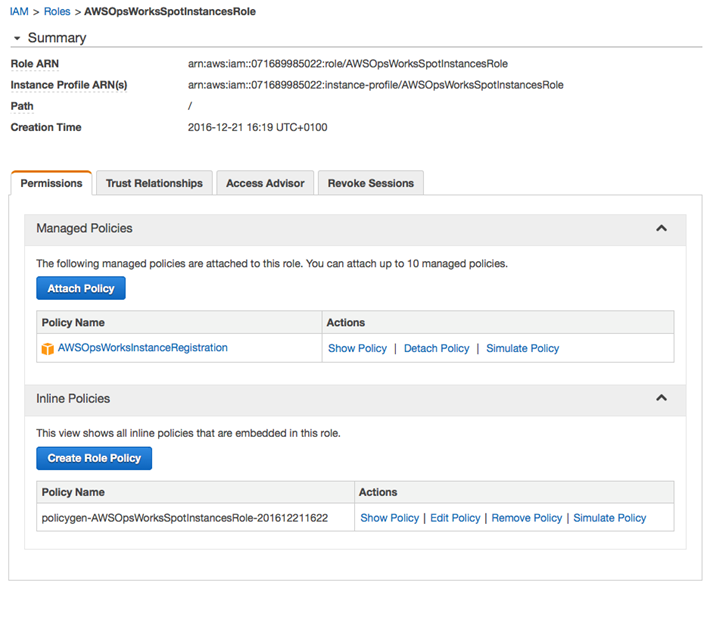 Choose the Amazon EC2 role, and then select the check box next to the AWSOpsWorksInstanceRegistration policy. Finally, select Next Step, and then choose Create Role. As its name suggests, the AWSOpsWorksInstanceRegistration policy will allow the instance to make API calls only to register an instance. Copy the following policy to the new role you’ve just created. This Lambda function deregisters an instance from your OpsWorks stack. It will be invoked whenever the Spot instance is terminated. Open the AWS Lambda console at https://us-west-2.console.aws.amazon.com/lambda/home, and choose the option to create a Lambda function. If you are prompted to choose a blueprint, choose Skip. Type a name for the Lambda function, and from the Runtime drop-down list, select Python 2.7. Whenever the Spot instance is terminated, the Lambda function from step 2 must be triggered to deregister the instance from its associated stack. 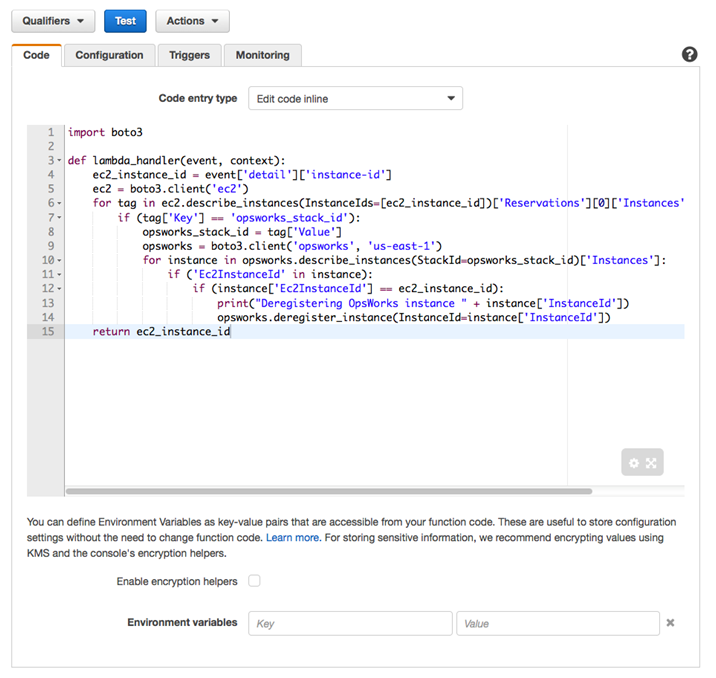 Open the AWS CloudWatch console at https://console.aws.amazon.com/cloudwatch/home, choose Events, and then choose the Create rule button. From Event selector, choose Amazon EC2. Select Specific state(s), and then choose Terminated. Under Targets, for Function, select the Lambda function you created earlier. Finally, choose the Configure details button. Important: Be sure to turn off auto healing for all of the layers in your stack to which you assign Spot instances. Otherwise, auto healing will attempt to revive your instances upon termination. When the instance has been provisioned and come online, you’ll see fulfilled displayed in the Status column and active displayed in the State column. This process will take a few minutes. After the instance and request are both in an active state, the instance should be fully booted and registered with your OpsWorks stack/layer. You can also view the instance and its online state in the OpsWorks console under Spot Instance. You can manually terminate a Spot instance from the OpsWorks service console. Simply choose the stop button and the Spot instance will be terminated and removed from your stack. Unlike an On-Demand instance, when a Spot instance in OpsWorks is stopped, it cannot be restarted. If your Spot instance is terminated through other means (for example, in the EC2 console), a CloudWatch event will trigger the Lambda function, which will deregister the instance from your OpsWorks stack. You can now use OpsWorks Stacks to define your application’s architecture and software configuration while leveraging the attractive pricing of Spot instances. If you have questions or other feedback, please leave it in the comments.